Visitors to Singapore are often struck by the fact that such a modern city-state has its own creole. Singlish—short for Singapore English—blends the tongue of British colonisers with Chinese dialects and a smattering of Malay. Among its most common traits is the punctuating of sentences with a forceful “lah”, which carries no meaning, but adds emphasis. Lee Hsien Loong, Singapore’s Cambridge-educated prime minister, wants this practice to stop. He is among the officials embarking on the Speak Good English campaign, an annual event aimed at sharpening the country’s competitive edge. On May 13th, Mr Lee urged Singaporeans to speak in full sentences and refrain from using “lah”. He also lashed out at text messaging, claiming the truncated spellings used on mobile phones could cause written-language skills to become “too mutated”. Wah, they should be more relax. Eh, government can make people change way they talk? Can? Cannot! There are all kinds of excuses we can come with as to why this is okay, and why we should just let it go as an “internal matter.” But I don’t see it that way. Reading this article made me sick, and hearing in my head all the pre-rehearsed excuses of the apologists just makes me sicker. China has detained a prominent member of Hong Kong’s international press corps who traveled to the mainland to obtain a collection of secret interviews with a Communist leader purged for opposing the 1989 Tiananmen Square massacre. Security agents apprehended Ching Cheong, chief China correspondent for Singapore’s Straits Times newspaper, on April 22 in the southern city of Guangzhou, where he was scheduled to meet a source who had promised to give him a copy of the politically sensitive manuscript, according to the journalist’s wife, Mary Lau. If charged, Ching would be the second journalist for a foreign newspaper arrested by the government of President Hu Jintao in the past year. Zhao Yan, a researcher in the Beijing bureau of the New York Times, was arrested by the State Security Ministry in September on similar charges and has been held incommunicado without trial since. The arrests could have a chilling effect on foreign news operations in China. The Chinese government often jails Chinese journalists and writers — the advocacy group Reporters Without Borders says there are more journalists in prison in China than anywhere else in the world — but in the past it has generally refrained from arresting individuals employed by foreign news agencies. What’s your definition of a police state? Does China qualify? To me, it is where people are afraid to speak because the police have the power to arrest and hold them at will, as Stalin’s secret police and the Gestapo did. Is this an examnple of the behavior of an enlightened government or of a police state — or of something in-between? The question is sincere. I generally choose not to refer to China as a police state, as there are aspects of the country that seem to go against the classic definitions. But each time I read stories like this, I am forced to reconsider. There were so many comments to the earlier post China Snag by William Stimson that I’m sure not everyone could slog through them all. So I wanted to call attention to one of the comments that resonated with me and make sure it received the attention it deserves. It’s from a new commenter, NiuBi4, who I hope will comment more in the future. I should like to add my full support to the sentiments expressed by Mr. William Stimson. He gets the China point entirely. Full Marks. We should carefully read the posts of steve, leo etc above to understand the exqusite, tragic irony that their point of view represents. dysfunctional Chinese geo-political landscape – and it is certainly not what Mr. Stimson is calling for in his piece. 2. If the Chinese people of the world found themselves capable of uniting sufficiently and worked together to create a Chinese political universe which alllowed for the emergence of the individual and the release of the true creative human potential of the ordinary people, then and ONLY then will the Chinese nation displace its true weight in the world commensurate with their actual numerical status of approx. 25% of the world population. 3. The nightmare scenario of the world laughing at a ‘collapsed’ China is already here! Not because China is physically broken up or exploited by those always lurking ‘foreign’ powers but, as Mr. Stimson wisely observes ‘China’s rulers, like their predecessors, have not just robbed China, but they’ve robbed the world of China.’ ! 4. The best scenario that could ever happen to China for those who some people imagine would wish to ‘contain’ China or prevent it from being a ‘non-neglectabe player in the world after a hundred year humiliation and disasters’ is for the current CCP tyranny to simply continue indefinitely! Bacause for as long as the majority world Chinese population has its potential, resourcefullness and intelligece negated by their humiliating submission to an arrogant mafia-style government the Chinese impact in the real world will always be far less than their numbers, history and culture truly deserve. 5. The key point is that by bravely and sucessfully floating democratic politics and dumping the 20th century Chinese one-party dictatorship model, Taiwan is already ‘independent’ of the dumb twilight quarrantine from which those living under the violence-based police-state dictatorship of CCP China have yet to emerge and which is now becoming ever more apparent to the once-free Hongkongers. Mr. Stimsons’ point is that Taiwan, in fact is already ‘independent’. It is the ‘independence’ of Mainland China itself that those who care about individual Chinese people and their nation as a whole must seek to bring about. That is if the world is ever to accord China and the Chinese people the respect as individuals and as a nation that all free people and free nations have a right to demand. 6. For as long as the CCP can get away with making the steves and leos of this world feel ‘patriotic’ and ‘proud to be Chinese ‘ etc etc [!!] as a result of a few technical adjustments to the economic system within the dictatorship they will continue laughing, shaking their heads in amazement at their luck. And why not? The great lie of their CCP = China formula continues to sell to steve, leo etc. and it keeps them in business so successfully, in ways that even they could not have imagined when they began their adventure. The world is a greatly poorer place as a result of the squandered potential of the millions of ordinary Chinese people that we see all around us daily in the PRC. Just because the majority of those individuals currently have either no idea of what they are missing or are just tired and benumbed by the constant bragging of their masters claiming credit for what little ‘normalization’ of daily life and resulting outward ‘glitter’ has been acheived by the recent reforms. Those who fear the consequences in the world of freedom for all Chinese are served well by the CCP and are dutifully assisted by the half-informed steves and leos. Western China desperately wants to be international, which is commendable. But somebody please tell the Qinghai highway department that translating road signs with a Chinese-Latin dictionary is not a good idea. Roland van Asch, an Australian reader working with a forestry project, sent in this baffling sign, which is actually trying to tell truck drivers to keep right. 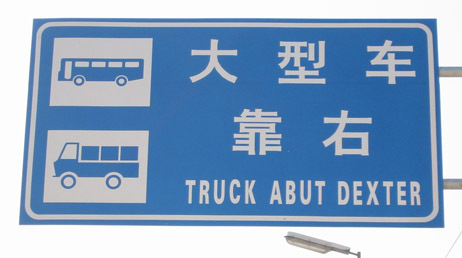 I want to know what the highway department was doing with a Chinese-Latin dictionary. CDN’s Sophie Beach has written an important article on the growing assertiveness (and sucess) of Chinese lawyer demanding that individual rights be recognized and respected. This movement grew out of the the Sun Zhigang tragedy, the poster child of so much that is wrong with China’s corupt system. Sun Zhigang, a young graphic designer from Hubei Province, was arrested on the streets of Guangzhou in March 2003 for not carrying a required registration permit. Police brought him to a “custody and repatriation” center, one of the hundreds of detention facilities run by local governments to control migrant populations. Three days later, Sun was dead. Reporters from Nanfang Dushi Bao (Southern Metropolis News), an aggressive daily run by groundbreaking editor Cheng Yizhong, soon discovered an official autopsy report that found Sun had been beaten to death in custody. Though well aware that a story on the autopsy would infuriate local officials, Cheng gave the go-ahead to publish it anyway. The article touched off a national scandal that led to important government reforms. But true to the nature of contemporary Chinese society—where emerging free-market forces regularly collide with authoritarian traditions—it also landed Cheng and three colleagues in prison. The ensuing court battle became a prominent example of an emerging movement in China known as weiquan in which lawyers and legal scholars are more assertively defending the constitutional rights of individuals, including journalists, in court. The defense in the Nanfang Dushi Bao ultimately won the release of Cheng and another defendant and secured shorter prison terms for the others. But weiquan’s gains are modest thus far—and the government has shown only the most limited tolerance for its goals. Immediately after Nanfang Dushi Bao broke the Sun story on April 25, 2003, newspapers and Web sites throughout China republished the account, chat rooms and bulletin boards exploded with outrage, and legal experts intensified calls for the abolition of the abuse-ridden “custody and repatriation” centers. In June 2003, the central government announced that all of the more than 800 centers would be closed. Six police officers and officials were jailed for their role in Sun’s death. The positive outcome was a rare example of the Chinese media and public opinion exerting powerful influence over society. But local governments, which control all local media, including Nanfang Dushi Bao, wield considerable power in China—and, within a year, Cheng and three other top officials from the paper were behind bars. Of course, the reporters soon found themselves behind bars on cooked-up “corruption” charges, but the weiquan movement helped generate a massive effort by journalists to see their colleagues released. And it worked. This can only be called a bittersweet article and you should read it all. There’s a lot of hope, but also a lot of despair. Several successes, but also a huge number of groteque injustices. That the movement exists at all and has proven to be effective is a great sign of hope. That the crimes it is addressing were carried out by the government, which is continuing to imprison reporters and silence the media, drives home just how rotten the sytem is. Many years ago I found myself in a biochemistry graduate course at Columbia University in which almost all the other seats were filled with Chinese. The professor graded on a curve. I had to work a lot harder for an A in that course than I ever had in any other. That’s when I first discovered Chinese are smart. I wondered what happened to smart China? How come it got left so far behind in the dust? I’ve lived in Taiwan for over two years now and I think I’ve found the answer — not from Taiwan, but from China, which looms menacingly over this free little country in such a way that anyone who lives here can’t help but take note of the bizarre pronouncements that issue from it. These speak volumes about why China is so backward and has stayed that way so long — and don’t bode too well for its future either. Such wording says everything about China’s backwardness because it’s a veritable picture of the contract those governing the country have with their own people. It’s certainly not a deal anybody else in the world — Hong Kong or Taiwan included — would be motivated to buy into, if they had a choice in the matter. The way the leaders of China operate, though, is by not giving anybody a choice. This is the subtle logic to statements such as, “We’ll negotiate only after you accept our position.” They mean, bluntly, “You do as we say.” These are the terms of tyranny. China has a problem with this. Other countries around the world have moved forward and left primitive dictatorship behind. China can’t seem to shake it off. Taiwan got a nasty taste of the Chinese affliction when the Nationalists came fleeing the Communists and imposed their brute tyranny here. They massacred Taiwan’s intellectuals, confiscated land, and essentially grabbed everything in sight. “They’re crooks,” said the U.S. President when many millions of U.S. dollars given them to fight the Communists were discovered invested secretly in family business deals. In contrast, China still operates under the old system. Its leaders are as corrupt, unscrupulous and thieving as so many of their predecessors stretching back thousands of years. For generation upon generation, a great, a superior, an unparalleled civilization has been trying to happen, only it’s been parasitized by the smartest of its smart, who know only too well how to grab everything for themselves. Small wonder China has such a crazy mania for censoring information. That’s the way a tyranny works, pure and simple. It keeps everybody a little off balance, so they’re less likely to make trouble, or notice their rulers are robbing the country blind. Also, it provides a convenient excuse to get rid of whistleblowers. You can go to jail for exposing corruption. Whatever money, mansions or fine cars China’s rulers may be grabbing for themselves or their families is the least of their crime and of scant importance compared to the far greater evil they’re guilty of. For too many thousands of years now, corrupt officials like them have taken away the Chinese people’s future, the nation’s pride, the culture’s bounty and — worse by far — the ordinary Chinese peasant or worker’s right to speak the truth and to reach out with the whole of their life and talent and engage the world in a way that is real and true. That is the ultimate disgrace that can be done by someone with a smart mind who has scratched their way to the top — to deprive someone on the bottom who has so little to begin with and so much to offer. In doing this, China’s rulers, like their predecessors, have not just robbed China, but they’ve robbed the world of China. How sorely the world needs China’s vast intelligence, resourcefulness and imagination – the genius of its ordinary people. When you look at all that little tiny Taiwan has done, you get a hint of what vast China is capable of. Back in my graduate student days at Columbia University, I was so impressed with the smarts of the Chinese. But living now in Taiwan, just across the water from China, and listening to the jargon that comes out of that country, it strikes me — What’s the use being smarter than everybody if you don’t have the sense to use it towards a higher purpose? I’d rather be ordinary any day but live in a way that serves to set in place a system that has the foresight and breadth of vision to care less about low bullying stratagems than about a government by the people, for the people, and of the people — and about mechanisms of accountability that can at least periodically sweep the crooks out of office, and out of business. The amazing power of freedom, decency and democracy, as the case of Taiwan amply demonstrates, is that it releases the potential of ordinary people to accomplish the remarkable and extraordinary. China seems so arrogant and proud at how fast it’s acquired all the things of the modern world, little suspecting it’s got the glitter but not the gold. Without freedom, it’s still stuck way back there in the dust. William R. Stimson is a former New Yorker who now lives in Taiwan. I tried my own experiment, posting comments on Internet chat rooms. In a Chinese-language chat room on Sohu.com, I called for multiparty elections and said, “If Chinese on the other side of the Taiwan Strait can choose their leaders, why can’t we choose our leaders?” That went on the site automatically, like all other messages. But after 10 minutes, the censor spotted it and removed it. Then I toned it down: “Under the Communist Party’s great leadership, China has changed tremendously. I wonder if in 20 years the party will introduce competing parties, because that could benefit us greatly.” That stayed up for all to see, even though any Chinese would read it as an implicit call for a multiparty system. President Hu has fulminated in private speeches that foreign “hostile forces” are trying to change China. Yup, count me in – anybody who loves China as I do would be hostile to an empty Mao suit like Mr. Hu. But it’s the Chinese leadership itself that is digging the Communist Party’s grave, by giving the Chinese people broadband. This sounds rather simplistic and optimistic, I’m afraid, and I wonder whether Kristof, who lived in China and has written books about it, really believes the CCP is digging its own grave. Let’s keep our fingers crossed, but let’s be realistic, too. Update: Danwei is a but harder on Kristof than I am. I’ll be traveling for business all week and won’t be posting much. (Famous last words; I always find a way.) Back home on Sunday. There have been 126 car bombings in Baghdad in the last 80 days. That compares to 25 in all of 2004. Absolutely NOT work-safe, so proceed at your own risk.